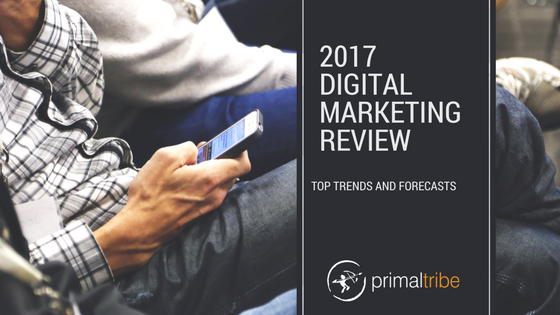 2017 was a year of continuous change and new developments in the world of digital marketing. We’ve seen steady contenders continue to grow, as well as shifting focuses bringing different applications to the forefront of the industry. Whether 2017 was a year of implementing a new marketing mix or holding the course for your business, there are a few trends (many of which we explored earlier in the year as they were emerging) worth noting as we move into the new year. See how your business stacks up against these industry leading methods! 2016 marked a sharp turn towards mobile prioritization for search engines as well as overall user presence (over 51% of all web users now access the internet using mobile devices). 2017 saw this trend even further, drastically changing our digital landscape. Google has taken direct steps to implement mobile-first indexing for websites, and more and more brands are relying on Accelerated Mobile Pages (AMPs), which implement a streamlined version of CSS that allows for fast loading. Internet users are on the go more than ever before, and being ‘mobile friendly’ simply isn’t enough to bridge the attention span-time allotment deficit. Learn more about More about how this will continue to shape the 2018 market later. Marketing automation software is platforms that allow marketing managers to, as the name suggests, automate marketing and sales engagement. As a result, the leads generated are often more informed, your analytics are more reliable, and your brand reputation sees a boost amongst your target audience. Throughout 2017, we’ve seen a strong push for more intuitive platforms, as well as the integration of complex AI programs. All of this ties into a more customer-centric approach, which we’ll cover in the next couple of points. As a consumer, you’ve probably started to notice the subtle (and sometimes not so subtle) personal touches that have been popping up in email blasts, ad campaigns, social media messages, etc. Why? The personalized approached provides desirable results for both consumers and businesses. When implemented properly, personalized campaigns typically see higher conversion, retention, and sales figures. Much like the push for mobile-optimized content has created the demand for quicker and more responsive web designs, customers now expect a higher level of personal engagement from brands they intend to, or are contemplating buying from. Optimizing your customer’s experience comes down to a finely crafted mixture of the three points above. 2017 proved that UX is a vital component to boosting your sales funnel online. Building your website, ads, and content to all be easily accessible online, as well as including a personal touch will take you a long way towards cultivating a steady client base that’s eager to return. Providing a seamless customer journey grew to an even greater priority in 2017. With the various resources, methods, and applications designed around helping B2B and B2C companies provide this level of service continuing to grow; the trend shows no signs of slowing down in the coming year. Learn more about how these practices are anticipated to impact digital marketing standards in 2018. Stay tuned for our FREE eBook and 2018 Digital Marketing Checklist!